No es casualidad que estos sean los temas del último número (volumen 26 – Octubre 2007) de la prestigiosa revista Science, edición On line. In the 26 October 2007 issue, Science and its online companion Signal Transduction Knowledge Environment (STKE) examine the processes and structures that underlie decision-making -- from cellular choices to major life-changing decisions. Review articles in Science discuss the role of the frontopolar cortex in human cognition, a neuroeconomic approach to the study of social decision-making, the decision-making dysfunctions associated with psychiatric disorders, and advances in decision theory. In STKE, two Perspectives look at decision-making at the cellular level from the decision of a progenitor to become a neuron or a glial cell to the influence of potassium channels on cell metabolism and excitability. Decision-Making Dysfunctions in Psychiatry—Altered Homeostatic Processing? 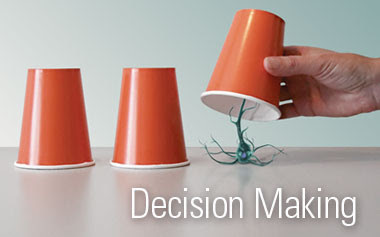 Decision Theory: What “Should” the Nervous System Do? publicadas por Divergente IDEAS @ 3:46 p. m.